Wyatt Russell is one of the stars of Overlord, Bad Robot’s first R-rated film (and not a Cloverfield movie). Avery is the director of Overlord, which opens November 9. In the film, a group of American soldiers is shot down over Nazi-occupied France and must complete their mission or the invasion of Normandy won’t happen. What they don’t realize is the mission will include defeating an army of zombies the Nazis have created to take over the world. Julius Avery on the set of Overlord with his producer, J.J. Abrams. As the movie was being made, people on the outside began to speculate Overlord may be another one of Bad Robot’s Cloverfield movies. The assumption made sense. Since that 2008 hit, Bad Robot has made two small genre movies (10 Cloverfield Lane and The Cloverfield Paradox) that filmed under different titles and were, very late in the process, revealed to be part of this burgeoning, fan-favorite shared universe. 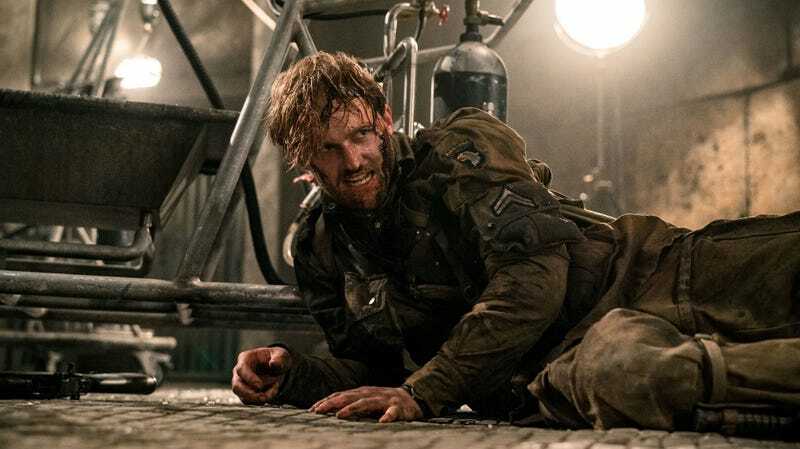 Overlord, with its mysterious genre plot and uneventful title, seemed to follow the same pattern—but, in fact, it never had anything to do with Cloverfield. Still, Avery didn’t mind the speculation. Avery and co-star Mathilde Ollivier on the set of Overlord. If early reviews (including ours) are any indication, Avery did get it right. Another clue is that the director is already attached to make a new Flash Gordon movie, and Overlord hasn’t even opened yet. It seems that kid from Western Australia is well on his way, and the only monsters he needed were a few Nazi zombies.